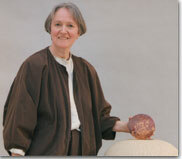 Since 1989 Christine-Ann has also been working with a vitrified earthenware clay making large pots and water features. The summer of 1992 she spent on an international workshop in Tokoname in Japan and in 1996 she received a Winston Churchill Traveling Fellowship to return there to “explore the way water is used in landscape architecture”. A project award from South West Arts has enabled her to develop some of the ideas evolved from the trip. In 1997 she was named ‘Somerset Craftsperson of the Year’ for her new work. Travelling, photography, reading, classical music, Tai Qi. Knowledge of French and Chinese.